Charles Patrick Dugan of Del Rio, Texas, a retired U.S. Marine Corps infantryman and survivor of heavy combat in Vietnam, gave his rank and serial number to his muscular Jack Russell terrier by calling him Cpl. Jack Russell Dugan, USMC, 2164539, or "Cpl. J.R." for short. Dugan and the dog often exercised by walking through four local cemeteries. As it neared Veteran's Day one year, Cpl. J. R. ran off unexpectedly. Dugan found the dog scratching at a neglected grave marker. Brushing the debris away, he was amazed to find that the dog had found one of the only military gravestones in the cemetery. It was inscribed with the dog's same name, Jack A. Russell, Texas, Cpl. Signal Corps. Charles Patrick Dugan of Del Rio, Texas, a retired U.S. Marine Corps infantryman and survivor of heavy combat in Vietnam, gave his rank and serial number to his muscular Jack Russell terrier by calling him Cpl. 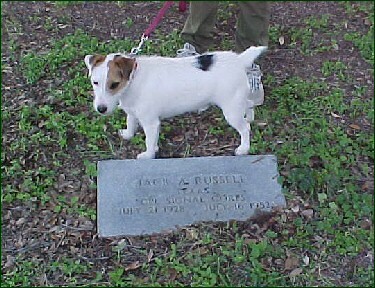 Jack Russell Dugan, USMC, 2164539, or "Cpl. J.R." for short. Dugan and the dog often exercised by walking through four local cemeteries. As it neared Veteran's Day one year, Cpl. J. R. ran off unexpectedly. Dugan found the dog scratching at a neglected grave marker. Brushing the debris away, he was amazed to find that the dog had found one of the only military gravestones in the cemetery. It was inscribed with the dog's same name, Jack A. Russell, Texas, Cpl. Signal Corps. After Dugan swept the tombstone clear of debris, the dog rested on the headstone of his namesake who had died during the Korean War. Cpl. Dugan says, "A little dog paid honor and respect by bringing new meaning to the belief that no soldier should ever be forgotten." Now, Cpl. Dugan shares details of his remarkable story in the new book "Angel Dogs: Divine Messengers of Love" by Allen and Linda Anderson with a foreword by Willard Scott (New World Library, October 2005). Dugan's story shows that a dog's loyalty need not be underestimated. Dogs have served in the U.S. military since World War II, detecting landmines and offering companionship and safety to soldiers. In the current Iraq war, stray dogs are befriending military units and individual soldiers. This occurrence has become so prevalent that a movement and Website, militarymascots.org, has been organized to help bring these loyal canine friends home when the soldiers return. Allen Anderson says, "Cpl. Dugan's story is one of the thousands we've receive that show animals have a way of letting people know that they are never truly forgotten or abandoned." Take for example another story in the Andersons' collection that demonstrates how the loyalty of dogs sustains people during times of war. Bob Shaw, an award-winning writer and newspaper columnist from Benton, Missouri, writes about Pinkey, a blond cocker spaniel who made her family wonder if she might be able to read. Pinkey was Shaw's constant boyhood pal and the family's "little thief" -- she stole baseballs from a nearby amusement fairground booth, hiding them in her backyard. After Shaw enlisted in the U.S. Air Force and was sent to Vietnam, Pinkey mourned for the loss of her best friend. When Shaw's first letter home arrived from overseas, the family read it eagerly and left it on the kitchen table. During the night, Pinkey stole the young soldier's letter and curled up in her bed with it tucked under her chin. From that point on, Pinkey kept all of Shaw's letters in her bed and slept with them every night. A musician who celebrates the late-in-life relationship between his father, a Tennessee college football coach, and his dog by writing a popular country song about them. In 1996, Allen and Linda Anderson co-founded the Angel Animals Network and its free online "Angel Animals Story of the Week" at http://www.angelanimals.net. "Angel Dogs" is the latest in an ongoing series of books that contain inspiring stories about courageous and loyal dogs. The book has favorable reviews in "Publisher's Weekly," "Best Friends," and "Foreword" magazines. It is available through bookstores nationwide and at online booksellers.